The transition to school opens up a new world for twos. The teachers will lovingly help your child learn to separate from you. The class will work on social skills such as listening, getting along with classmates, self-control and using words to express their needs. Transitioning to a new activity is a skill that takes practice, but the children will learn to move from one activity to another without frustration. Students will develop large muscles with daily outside play, climbing, running, riding trikes, and dancing. Play dough, puzzles, painting, drawing and cutting will develop fine muscles. Classroom activities will foster development of creativity, imagination, problem solving skills, exploration and experimentation. Language skills will be enhanced through listening to stories, dramatic play, singing, and interaction with the staff and other classmates. Vocabulary and speech will grow through fingerplays, stories and rhymes. Independence and cooperative play are typical of threes. 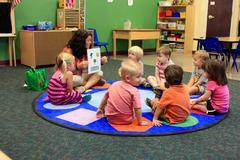 Children will work on sharing, listening to stories, and participating in circle time activities. Children will play cooperatively with other friends, and understanding personal space will become more important as a tool to get along with others. They will learn to put away their things, pick up after playtime, clean up if they make a mess and become more self-sufficient. Language becomes more of an emphasis in the three’s classroom. Students will play with words in phonemic games, listen to rhymes, and listen for words alike and different. They will discuss pretend and real and classify books and stories. Children will begin to write their name and awareness of written language emerges as teachers write their words on paper. Through fingerplays, songs, classroom discussions, and comparisons, understanding of language increases. Children will begin to problem solve when a question is presented to them. The calendar is an important tool for math, as well as language. Children will count, learn patterns, talk about what year it is, what month it is, and what day it is. They will count objects at center time. They will graph who likes which color of apple, or what type of shoes they wear. They will work on number recognition, and begin to understand one to one correspondence. Sorting and matching objects also further develops their math skills of comparison and critical thinking. In the four’s classroom, children build upon the skills learned at three and prepare for the kindergarten year. Increased curiosity about language will provide many opportunities to explore words, letters, sounds, books and stories. Phonemic games, rhyming words, and word comparisons will increase their awareness of spoken language. Children will learn about authors, illustrators, and story characters, as well as changing the story ending. Language in the form of writing will begin with the Handwriting Without Tears program. They will make journals, class books, write class stories, and write in a variety of media. Math skills are increasing in the four’s class. They will continue work on one to one correspondence, and increase their language with math comparisons in size, shape, and position in space. Patterning will become more complex, and predictions will be made. Estimation, graphing, ordinal numbers, position of objects in space and numeral recognition 1 to 10 are concepts they will acquire. Independence grows in the PreK classroom as responsibilities grow. Children will self monitor themselves when choosing centers, grow in communication skills when problem solving with other children, become independent with fastening their clothing and in handling their lunchboxes. These skills are encouraged so independence will be comfortable in kindergarten. Interpersonal skills will grow in learning how to handle differences of opinion, talking out differences with others, and learning respect for others who may have different attitudes and beliefs. Science and social studies activities in the PreK classroom include simple experiments and cooking. Students will study space, dinosaurs, insect growth and development, cowboys, and the seasons. School readiness is not magically achieved on a child’s fifth birthday. Readiness is built on years of experiences that support the development of a child’s cognitive, physical, social, emotional and language skills. Before children can master academic tasks, they need time to pretend, build, climb, play, draw, question, and observe. It is important to look at children from a development perspective when considering school placement. Developmental readiness considers chronological age, social and emotional stability, physical abilities and cognitive understanding. Our Transition class provides children the extra time they may need for maturation if they are to be successful. It also includes children who are five by Dec. 31, whose teachers have given recommendation that they are developmentally ready to be placed in this class. This is not a class reserved for gifted students. Circle time in the Transition class will be rich in literature and phonemic awareness. Students need to have a strong foundation in spoken language in order to be successful with written language. Songs, fingerplays, and phonemic games encourage children to manipulate sounds and play with language. Students will have many opportunities to develop early writing skills and to write. Transition class will complete the Handwriting Without Tears workbook and continue working on handwriting skills. This program helps them develop visual discrimination and necessary fine motor development needed to be successful in kindergarten. Send us a message with the contact form.